A lot of you watch me every day and wonder how I get so much done. When faced with so much opportunity, you wonder how I decide. And the truth is simple, I just do. Over the years I have developed an unbelievable amount of intuition, which is predicated on my experience in business which allows me to execute quickly and strategically on my goals. You need to move fast. I am more concerned about speed than being “right” on the first try. It’s so much better to try, fail, revise and try again then spend all of your time debating and never actually doing. For me it comes down to a few things. I’m reliant on my intuition because I have seen this scenario before. You start to develop pattern recognition and then your intuition takes over which allows you to make decisions based on all of your prior experience in life. At 41, I’m really starting to find this zen state where my experience and intuition combine. I’m not dwelling on the alternative, I’m deciding and reacting to figure it out. But for a lot of people who don’t make hundreds of decisions a day, you basically need to trust your gut. You need to look logically at the situation, analyze the pros and cons, trust your instincts, and decide. It’s the lack of fear of failing that has allowed me to make decisions so quick. People don’t make decisions because they are scared to lose. I make decisions because I want to know what’s going to happen, and then I use that information to help advise what I do next. The one thing I know for sure, is the outcome of what happens if you don’t decide. If you never make a decision, or deliberate for too long, all the upside or potential opportunity could be lost. The only thing I’m focused on when evaluating opportunity is the net score. The funny thing about being in this position, is I am now crippled with opportunity. There are so many things I “could do” and now I have to decide what “to do.” All of those decisions are really made on my intuition. What seems right at that moment in time. It’s not difficult to understand why more shots on goal, gives you a better chance to succeed. If I accomplish 14 things in a day, no matter how large or small, that 14 is undeniably more than 2. I’m on the offense so I’m just not worried about what other people think. I reverse engineer my own wants and needs and make decisions based on that. The last and most important thing is having good intent. But the truth is, when you’re coming from good intent, you don’t have to be worried about what other people think. I’m never worried about losing because when I have to explain why I made the decisions I did, nobody is going to be like wow, what an idiot, or what a bad person, or judge me based on some secret thing I had in mind. I’m very open and transparent with my reasoning so if I lose, I lose. 99 percent of things you have to “choose” in life really don’t matter and even on the biggest things, it’s always better to go with your gut than to overthink it. The more you think about it, the more you talk yourself out of it. Whether that’s school, or where to work, or where to live, it’s better to decide, test and react than become overwhelmed with options and possibility crippling your decision to move forward. The moral of the story is: the more you do, the more you learn. The more you learn from doing, the more trust and ease you’ll have with making decisions. The more trust you have with yourself in making decisions, the easier it’ll become to act when the time calls for it. At the end of the day, when you come from a good place, there’s no wrong decision. There might be short term consequences because you can’t always win, but long term, net net, you will come out on top. 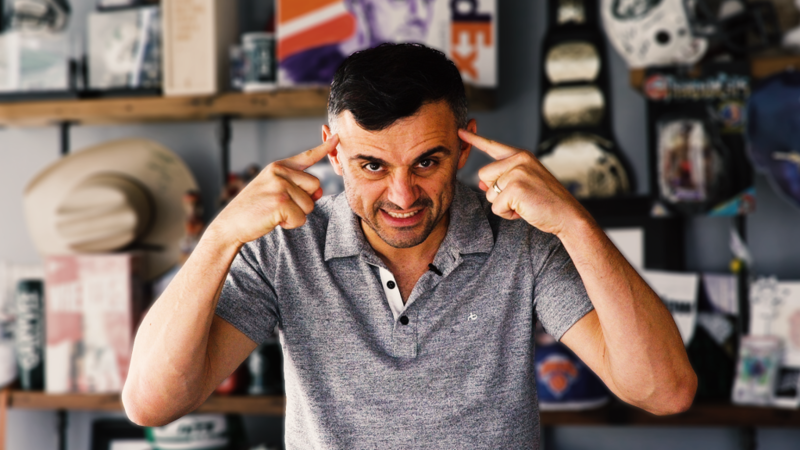 Gary Vaynerchuk is a New York Times bestselling author, entrepreneur, social media master, renowned business visionary. One of the best speakers in the industry, this “King of Social Media” can teach you a lot about entrepreneurship.